Taking Amtrak to any United States destination is the ultimate traveling experience. As opposed to flying, traveling by train cannot be a more relaxing way to go anywhere. In fact, taking the train is the smarter way to go. Everyone has taken Amtrak one time or another. Some have traveled on Amtrak often. Boston, Washington, DC, and Williamsburg, VA are great Amtrak destination cities. What about long-distance routes? Traveling on a long-distance train is a far different experience than riding the Northeast Regional, Acela Express, Vermonter, and the Pennsylvanian. There are a handful of important tips for passengers to keep in mind for traveling long-distance on board Amtrak. These are the tips to making any long-distance journey as painless and exciting as possible. 5) Luggage & carry-on policy: As opposed to the airlines, Amtrak is a bit more lenient on passengers regarding luggage. Passengers are allowed up to four checked pieces of luggage per person. Two are free, while the second two cost $20.00 each. Passengers are allowed up to two carry-on bags each, not including purses and laptops. Further, no piece of carry-on or checked luggage is to exceed a weight of 50 lbs. Each piece of checked luggage should not exceed dimensions of 75 linear inches. Amtrak takes passenger security seriously. Checked luggage, even carry-on luggage, MUST have ID tags attached. 4) One-hour arrival time: For all Amtrak long-distance routes, all passengers MUST arrive at the station one hour prior to departure. This window of time is necessary to allow passengers to successfully check in their luggage and complete the ticketing process, if they have not received their tickets via email or U.S. Mail. Passengers can also obtain their tickets from a Quik Trak kiosk. Quik Trak kiosks are available at all major Amtrak stations. 3) Pack adequately: When traveling on board any long-distance Amtrak train, passengers must remember to pack adequate clothing and supplies for their journey. 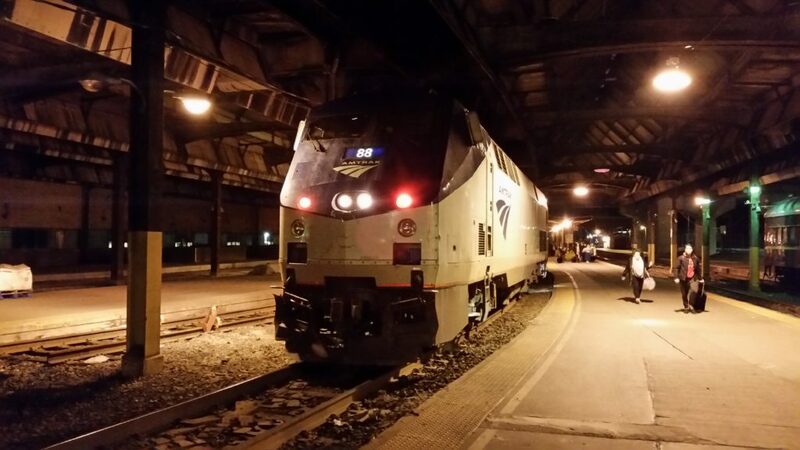 Some Amtrak long-distance trains take just one night to reach their destinations. Other trains such as the California Zephyr, Southwest Chief, and Empire Builder take two nights to reach their final destinations. Passengers must carefully plan out how much clothing they’ll need for their sleeping car cabin each day-both morning, afternoon, and the evening. Passengers traveling in a sleeping car should limit themselves to carry-on baggage. Note: Passengers will not have access to their luggage until they reach their destination. 2) Sleeping car vs. Coach: There is a huge difference between traveling in the sleeping car vs. traveling in coach class. Everyone deserves a good night’s rest. There is no better experience than experiencing a sleeping car cabin. Further, there’s no better experience than being rocked to bed by the train’s clicking and clacking of wheels on rails. Hearing the engine’s horn blowing through the night is all the more therapeutic. The following morning, well-rested passengers will feel like a million bucks. The best part: As long as passengers book a sleeping car cabin, their on board dining is included in their fare. 1) Bring additional nourishment: On any long-distance Amtrak route, delays are to be expected. Many of Amtrak’s long-distance trains run on major freight lines. Freight takes precedence over passenger service. In this situation, the café car and even the dining car can run low on food supplies. All passengers must be prepared for this situation. Passengers should pack additional nourishment. For nourishment, passengers should take along a small cooler bag with an ice pack, storing additional food items. Sandwiches, fruit, vegetables, and healthy snack items are sure to suffice. Additional nourishment is vital for passengers with medical needs, including diabetes and food allergies. Note: Amtrak cannot guarantee a reaction-free journey. Whether first-time or seasoned long-distance passengers, packing adequate nourishment is the deciding factor between a pleasant journey and a trip to forget.